Published on December 30, 2015 by Wade Shepard Follow me on Twitter here. This was hand written on a little sign that was placed on top of a large pile of personal possessions in Terminal E of Moscow’s Sheremetyevo Airport. The pile was inside of a 30’ X 15’ glassed-in enclosure, which seems as if it may have once been used as a smoking booth. There were suitcases, cases of beans and instant noodles, a blow-up mattress, and nearly a dozen jugs of water lined up in a row. Children’s shoes tailed away from this cache to the foot of a tent that had clothes spewing from its open flap. On the other side of the tent two bed rolls were splayed out upon the floor. 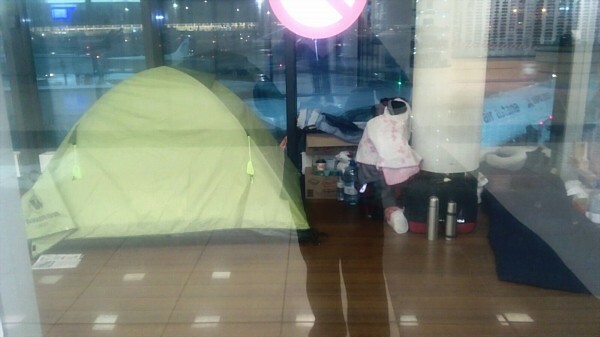 Luggage, clothing, and blankets were liberally strewn around the little enclosure like it was a backpacker’s dormitory rather than a public area in a major international airport. Nobody was home the first time I was there but the next time I walked by the camp was full. A family of five with three young children were sitting in a circle on the floor, eating a lunch of bread and olives out of plastic bags. A tan skinned young woman was leaning against the back window, planes on the tarmac were visible beyond. Hairy brown feet were sticking out from the tent. While a ragged-looking, wild haired man was sitting on a bed in the corner. The later made eye contact with me and nodded. The glassed-in enclosure made the people within seem like part of sick sort of museum exhibit. Masses of other passengers were flowing by. Sometimes I would catch sight of one of them glancing curiously at the people living in the little glass room before continuing on to their boarding gates down the hall. This little camp — if it could be called that — wasn’t in some secluded, obscure part of the airport but was right across from the food court, virtually within the waiting area for Gate 36. I walked up to the little enclosure, pried open the sliding glass doors, and entered. I introduced myself to the wild haired man on the mat. He name was Hasan Yasien, and he told me that he was a refugee from Syria. He introduced me to his neighbors: the family was also from Syria and the young couple with the tent was from Afghanistan. When I asked why they were living in the airport they were quick to respond that they were not there by choice. Rather, they were trapped, stalemated in the transit area of Sheremetyevo, unable to move forward or backward. Around 25 million passengers flow through Moscow’s Sheremetyevo Airport each year. Anyone who is flying international through there will invariably pass through the transit zone, which consists of three terminals — D, E, and F — that are strewn together by a mile long corridor that is studded with prohibitively expensive duty free shops, VIP dens, souvenir booths, capsule hotels, international restaurants like TGI Fridays and Burger King, and nearly 50 boarding gates. Refugee camp in Moscow Sheremetyevo. Transit zones in airports were first created in the 1980s as extra-territorial areas that governments could set aside to allow international air passengers to transfer flights without needing to go through immigration formalities. They are legal and political loopholes which acquiesce with the demands of aviation age, they are essentially frontiers that are geographically located within the bosom of established nation-states but are not officially part of any country. Being in the transit zone of an international airport is the same as being in the no-mans-land at a land border when you are stamped out of one country but not yet stamped into the next. This is why the shops cannot be taxed in these zones. While a convenient way to deal with the complex realities of air travel, many countries have exploited the extra-territorial status of transit zones, using them as buffers against refugees. For many irregular migrants, landing in a transit zone is to be locked within a Heller-esque conundrum: physically they are within a country, but not technically. So while Hasan and the other refugees are within the airport in Moscow they are not officially in Russia, so the country has no legal obligation to take responsibility and provide for them. So they are left sitting there, stuck in limbo. 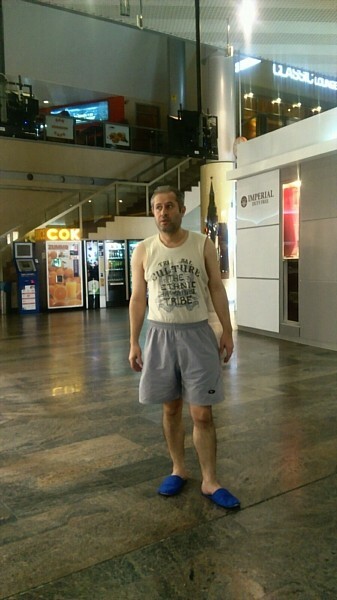 Hasan Yasien has been stuck in the transit zone of Moscow Sheremetyevo for over 133 days. Originally from Aleppo, the largest city in Syria, Hasan once worked as the director of a factory that produced knitted dresses. When hostilities began in 2011, Hasan’s once peaceful city turned into a battlefield — bombs began falling from the sky, extremists and militants of all stripes began shooting up the streets, and entire sections of town began being reduced to rubble. The factory where he worked was shut down, the cost of food rose to unaffordable heights, and the country’s currency plunged. Like 2.8 million other Syrians, Hasan decided to leave. He escaped first to Lebanon, but the deteriorating security situation there proved less than adequate. Hasan stated that his main goal was to join his brother, who had successfully obtained asylum in Germany, or make it to Canada, where he had unsuccessfully petitioned for admittance in 2004. Languishing in Lebanon with only had a thousand US dollars of his savings remaining, Hasan needed money. He heard of a Syrian-owned textile factory in Moscow that hired fleeing Syrians and got in touch, thinking that he could save some money and use Russia as a temporary staging ground from which he could arrange asylum in the West. The factory hired him and provided an invitation letter for a three month visa, Hasan provided the US$600 application fee. With a legitimate Russian visa in his passport, Hasan bought a flight with an advance from his new employer and flew to Moscow. Life in Moscow proved harder than Hasan originally anticipated. He claimed that the working conditions at the factory were horrendous. “Life was very tough. There was no vacation at all. There was no heating, and the weather was always very, very, very cold. The snow stuck to the doors from the inside,” he said. He told me that he worked for 12 hours per day, every day of the week, and that the factory owner proved to be less than scrupulous, capitalizing on the desperate situation of his workers and docked or refused their pay for feeble or otherwise contrived reasons. 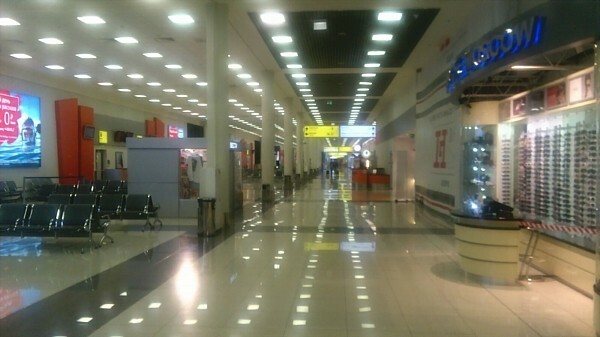 Transit zone of Moscow Sheremetyevo. Hasan’s complaints about Russia didn’t end at the factory. “Whenever I was going to work or returning home if the police saw me they would drive their car with haste to me, and then get out quickly as if they found a dangerous criminal.” He then claimed that the police would then require him to show his passport, whereupon they would inspect it and falsely claim that his visa was expired and that he would therefore need to pay a fine on the spot or endure arrest. Under these conditions, Hasan applied for a certificate of temporary asylum in Russia, which would get him an additional year as he further staged an asylum bid in a Western country. Although this plan was not to play out. After paying a non-refundable US$900 application fee and waiting three months for a decision, his application was rejected. His attorney appealed the verdict repeatedly, which gave Hasan three additional months in Russia each time while he waited for his case to again be heard. He eventually received a definitive decision: nope. He was denied on the grounds that Russia officially declared Syria to no longer be a dangerous place, so there was no need for Hasan to continue being a refugee as he could just go home. Not being allowed to remain in Russia and refusing to go back to Syria, Hasan would need to find somewhere else to go. But to where? Few countries have open doors for homeless, penniless Syrians. He set his sights on Antalya in Turkey, bought himself a ticket, and made to exit Russia on his own volition. On August 19, 2015 he entered Moscow Sheremetyevo airport, cleared exit immigration and customs, and stood by his gate waiting to board his flight to Turkey. He had spent a year and a half in Russia up to that point, and as he waited he assumed that the country was already behind him. But before he was to board he was pulled aside by an aged female immigration officer. She asked to see his passport. “America is fighting on your land?” she then queried. Hasan then recollected how she looked at him with disdain and ordered him to follow her into an interrogation room. “Wait. Sit there.” This was the only response he was able to procure. “Wait. Sit there.” Over and over. Hasan now only had about 15 minutes before his flight would depart, and the immigration official had still not returned his passport. He started to panic. “Come, follow me,” the immigration officer finally ordered. They walked back to his gate and she handed his passport to an airline crew member, stating that his court papers required this. When he arrived in Turkey his passport was handed directly to Turkish immigration. As for Hasan himself, he was taken into an interrogation room where he was informed that he would be immediately sent back to Moscow. “Why should we welcome you?” Hasan remembered the immigration officer coldly asking. To which he begged not to be returned to Russia. “Because your passport is not in your hand, this is a big problem,” the officer responded. Now back in Sheremetyevo, Hasan had little other option than to try to fly to Turkey a second time. He bought a ticket, and the process began all over again. Hasan later had his court documents read by a native Russian speaker, and there was nothing stating that he could not keep possession of his passport. 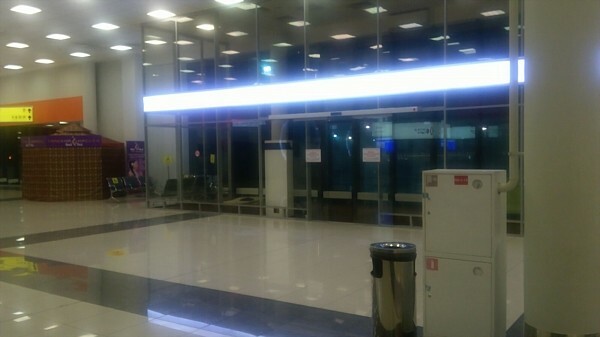 Hasan flew to Turkey a second time. Almost needless to say, he endured the same welcome. He was put on the next flight back to Sheremetyevo. Turkey obviously wasn’t going to work. Now without any money and even less prospects, Hasan began looking for another place to go. He decided that he would just return to Lebanon. A friend there booked and paid for a ticket for him. The Russian authorities again refused to allow Hasan to carry his own passport, again giving it to a member of the flight crew. Why physical possession of his passport appears to have been so essential is unclear. In the time it takes for a jet to fly from Moscow to Beirut and back, Hasan was again in the transit zone of Sheremetyevo. This time he was worse off than before. He made a vital mistake. Knowing that Lebanon was very hot at that time of year he packed all of his excess clothing into his checked-in suitcase, leaving himself with just a tank top and shorts. Neither this suitcase nor his clothing were returned to him, and he found himself living in the cold Russian airport dressed for the beach. At this point I couldn’t imagine the despair that the man in front of me must have felt. He was essentially a prisoner who did not commit a crime, locked up in a bureaucratic quagmire that had become a prolonged sentence, stuck in a place that had become a prison. “I felt sadness and bitterness and deep sadness,” he said. At the time that I met him, Hasan had been in the transit zone of Sheremetyevo for over 80 days. The Syrian family that was eating on the floor next to us had been stuck there for nearly four months. The young Afghan couple had been trapped for nearly three months. People getting stuck in the transit area of Moscow’s Sheremetyevo Airport is nothing new. The place has a notorious reputation as being somewhere that a person can easily trip into a political or legal pothole and never be heard from again. There have been popular Russian songs and movies about this happening, and many Russians claim to breath a sign of relief when their flight is in the sky and they watch this airport fading fast behind them. The Soviet-inspired mythology of Sheremetyevo continues being affirmed through present reality. At times visitors have described parts of the transit zone as looking like a refugee camp, and it’s the truth: asylum seekers from a host of countries can be seen sleeping on pieces of cardboard and bathing in the bathroom sinks. The US Department of State’s 2010 Human Rights Report on Russia mentioned a group of 16 Somali refugees who had been living in the transit lounge of Sheremetyevo for many months, sleeping on the floor and begging for food from passengers, as they waited for the bureaucratic wheels of their asylum bids to spin their course. They were all eventually denied and most of them were shipped back to Somalia. 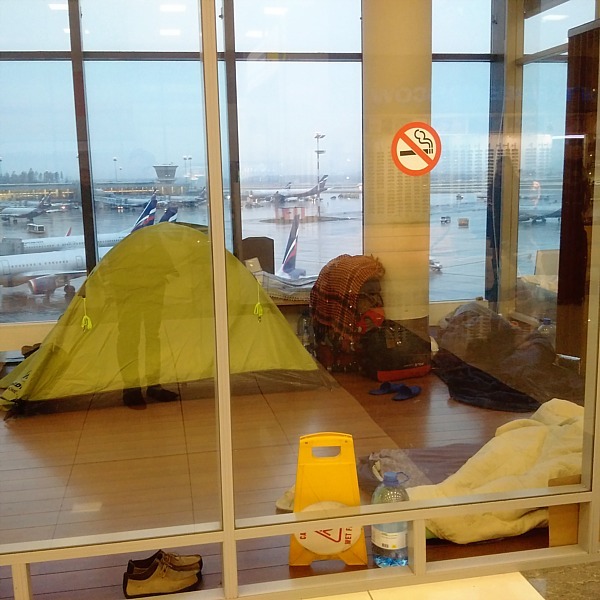 Refugee camp in the Moscow airport. Although the airport’s most famous resident was American. After his passport was abruptly canceled while en route to South America in 2013, Edward Snowden supposedly spent a month in the transit area of Sheremetyevo. In here they disrespect us, police have attacked us, they throw our belongings in the middle of the transit hall. She push me, I hit the wall, and blood drip out from my mouth. She told me you have too much staff, don’t sit here, sit there. Every night she questioning us: Who you are? Where are you going to? There is not humanity here, no human rights, nobody cares about us, nobody hears our scream, and all doors are closed to us. We sleep on a cold floor. It doesn’t seem as if living conditions at Sheremetyevo have improved much since Zahra was in residence. 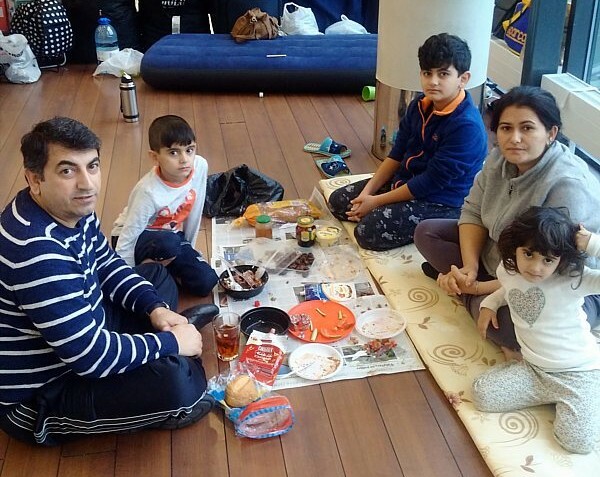 Hasan was not hesitant to point out the hardships he and the other refugees have endured in the airport. He complained about the quality of the food he is given, saying that it upsets his stomach, that he has difficulty sleeping at night because of the constant blaring of the airport’s loudspeakers, and that has not been able to shower for over a month — the airport staff claiming that they’ve lost the key to the bathroom. So the stuck Syrian wanders through the transit area ragged and unclean, his clothing filthy and stinking, his hair disheveled. He looked like a bum. The Russian branch of the High Commissioner for Refugees (UNHCR) has taken up Hasan’s case. They are the ones who bring him his daily meal and gave him a blanket and a bed roll. Hasan added that a girl who works at the airport gave him a set of pajamas as an act of kindness. This is where Hasan sleeps. I asked Hasan what he does in the airport to pass the time. He responded that he reads novels, articles about health, and studies foreign languages. Sometimes he walks over to Terminal D to watch movies. He has a smart phone with him, so he has internet access — his only connection to the world outside the three terminals of the transit zone. Since he first became stuck in the airport, Hasan has been petitioning the Russian branch of the High Commissioner for Refugees (UNHCR) for help. After nearly three months they appointed him a lawyer who is taking his case to the European Court of Human Rights. 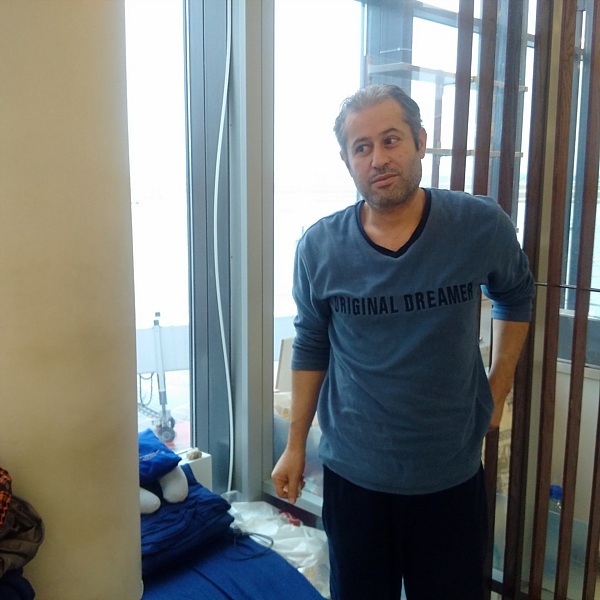 In the meantime, he was required to submit an application for asylum in Russia on the threat that he would otherwise need to remain in the airport indefinitely and the UNHCR would not be able to assist him. He claimed that he submitted the application on October 19th. He has yet to receive a response. 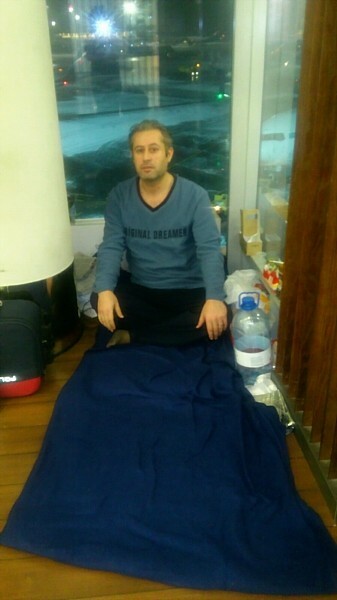 Hasan is still stuck in the transit area of Moscow’s Sheremetyevo airport, 133 days and counting. 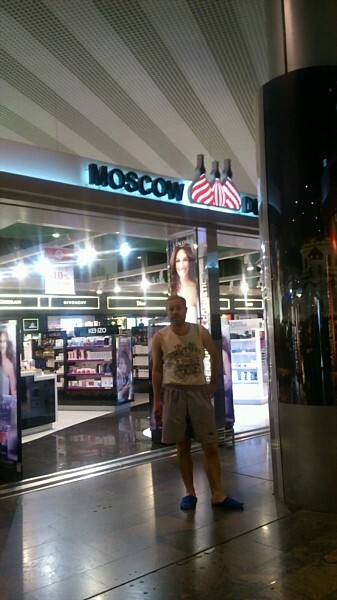 Hasan in the transit zone of Moscow Sheremetyevo.